The last few days I have felt on the edge of a niggly cold. So one of the first things I always do, when that feeling hits it cook up a big pot of chicken and vegetable soup. This one, I added lots of vegetables, but blitzed it up, not to disguise them, as my family love their vegetables but to create a more creamy texture. 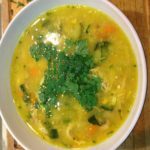 But If you have kids who turn their noses up at anything that resembles a vegetable, then this soup would work for you. 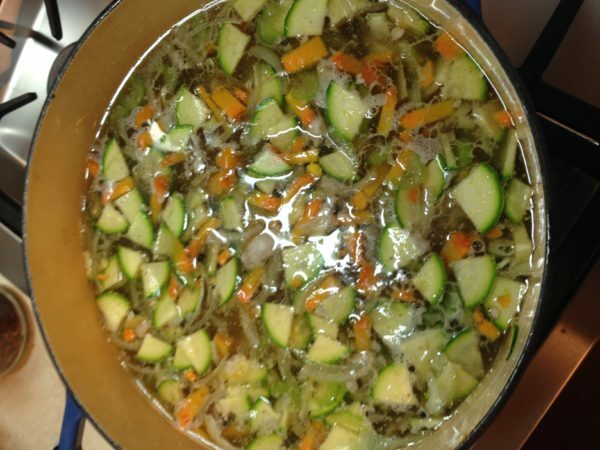 With any soup, the stock is always the essential ingredient. I often have my slow cooker on, loaded up with chicken bones, bubbling away for hours. Then I store it in containers, placed in the freezer, ready to be used for soups, braises or any sauces and dishes that needs flavouring. Why do I make my own and not from a packet? I know we are all so busy these days and its often easier to grab a packet, but if there is one thing I never skimp on, its homemade stocks/broths. Most packet stocks and stock cubes have ingredients in them, that have very questionable additives, a lot of salt and hardly any real bones from the animal been used, therefore little if any nutritional benefits. 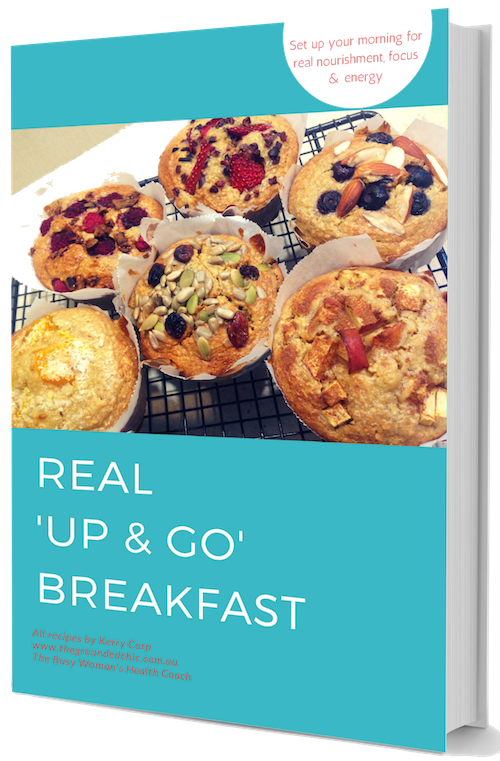 So from a nutritional point of view, I am very questionable on them, You can source some ok ones, but I always recommend making your own. According to Sally Fallon, Author of ‘Nourish Traditions’ and President of Weston A. Price Foundation, Meat and Fish stocks are used almost universally in traditional cuisines. They are extremely nutritious, containing numerous minerals and gelatin, which has been proven to aid digestion and numerous chronic conditions. ” Nourishing Traditions’ is a book I highly recommend to anyone who is interested and passionate about real food. 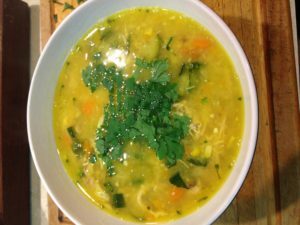 In many ancient traditions, chicken soup is the remedy for colds, flu’s and many health problems. 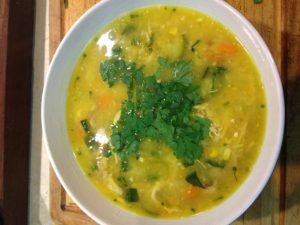 In Jewish culture, it is called the ‘Jewish Penicillin” and has been prescribed by many a Jewish Mother. This recipe is not a quick recipe, but one you can make in bulk, keep in the fridge and have either over a few days or store some in the freezer for a later time. 6 chicken drumsticks Or 1 whole chicken I often use a whole chicken and cut up half the meat fo the soup and keep the other half for a later meal. Place your chicken pieces or whole chicken into your chicken stock, along with your sliced onion, carrots and celery. Add some salt and pepper to season. Bring to the boil. *If using a whole chicken, if it doesn't all fit into your pot, or covered with liquid, you may need to cut it in half. Once you bring it to the boil, reduce to a simmer and add half your chopped corn, all your pumpkin, zucchini, garlic and turmeric, then simmer for approximately 1-1&1/2 hrs, till your chicken is well cooked through. Remove your chicken from the pot, place on a chopping board and chop up the meat. If using drumsticks, use all of them. If using a whole chicken, use half the chicken and reserve the rest of the cooked chicken for another meal. 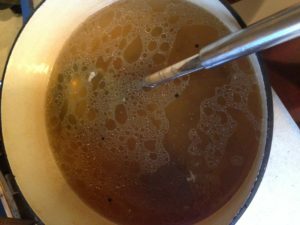 Add chopped chicken back into the pot and with a stick mixer, blend up your soup. This will disguise your vegetables, if you have fussy eaters and make the consistency more creamier. Add the final pieces of corn and your chopped Broccolini ( If fussy eaters and they don't like Broccolini, then you can leave this out.) Grab your handful of dried spaghetti and break up into smaller pieces and add to the pot. Cook for a further 7-8 minutes or according to your noodle packet instructions. * sometimes I use alphabet pasta. Kids love this and often distract them from the vegetables they are consuming! 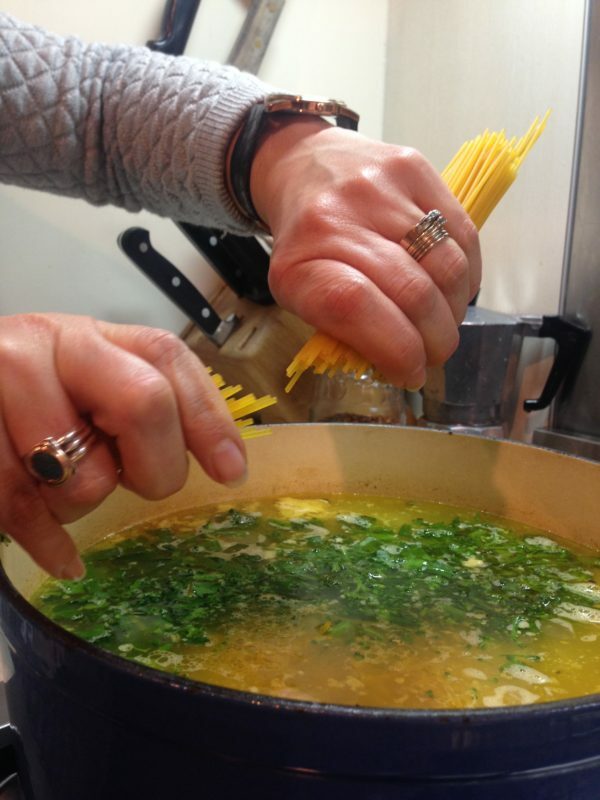 Serve in bowls with a sprinkling of chopped parsley if you like. The thing I love most about soups, is although some take a while to cook, most of the cooking is taking place while you go about your day. It just sit on the stove simmering away, teasing you with it's nourishing aroma's. One to cook up on a cold wintery Sunday, perhaps? Next PostDo you stuggle to set boundries?